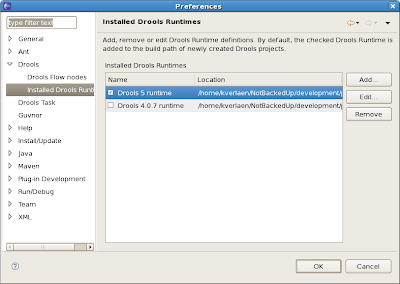 Can you please elaborate on drools parameters feature. What are the differences between globals and parameters? What are factParameters and globalParameters? How to define parameters in the DRL files? What are the differences beteen in/out/inout? Does parameters have any effect on the performance? Will the package-builder detects errors if the parameters were wrongly defined? The global is what you declare in the DRL. The parameter is one way in which to map external variable names against these globals as in, out, inout parameters. You really need to know the different between Facts and Globals, to under FactParameters and GlobalParameters. FactParameters are when you insert a Fact into the working memory and GlobalParameters are for when you want to set a global. Both support in, out, inout capabilities. No parameters have no effect on the performance, it's just some external java mapping code. You don't declare parameters in the packagebuilder, you declare globals. If you try and set a global that is not defined, it will indeed error. The example code in the blog shows you how to use parameters against a stateless session.